Lima Central Catholic’s Rosie Williams shoots over Celina’s Maddy Luebke in the first half at the Msgr. Edward C. Herr Gymnasium at LCC Schools Monday. Williams finished with 15 points and 17 rebounds. Lima Central Catholic’s Hannah Garver tries to take the ball away from Celina’s Emma Homan in the first half at the Msgr. Edward C. Herr Gymnasium at LCC Schools Monday. Celina’s Brooke Robbins tries to get a shot off over Lima Central Catholic’s Ana Rios in the first half at the Msgr. Edward C. Herr Gymnasium at LCC Schools Monday. LIMA – Herr Gymnasium started out a little chilly after a boiler malfunction wasn’t able to be fixed until late in the day. And the first half seemed to mirror the early frosty conditions. 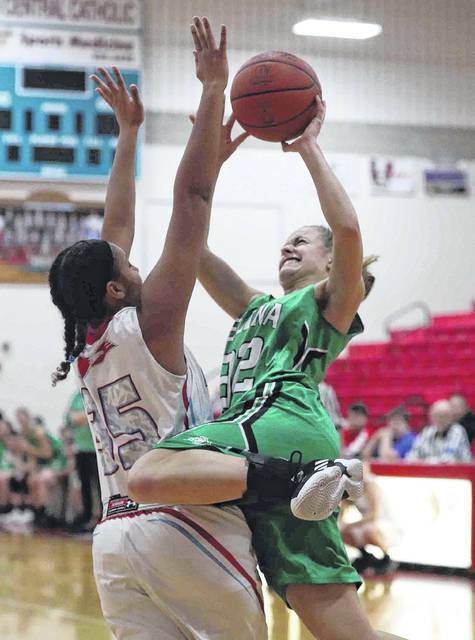 Lima Central Catholic got its inside-outside game rolling in the second half and pulled away with a 40-23 girls basketball victory over Celina Monday at Herr Gymnasium. LCC’s Rosie Williams took over inside in the second half. She finished with 15 points and 17 rebounds. Mary Kelly Mulcahy came off the bench for 13 points, seven rebounds and three 3-pointers. Celina, which went 2-22 last year, is 4-11 under first-year coach Cenzie Rushton. LCC played without two key players, Jessica Wilker (concussion) and Josie Mohler, who torn her ACL in her knee just before Christmas. The senior Mohler hopes to return soon and finish out the year before having surgery. Celina’s Bailey Exman led the Bulldogs with seven points. 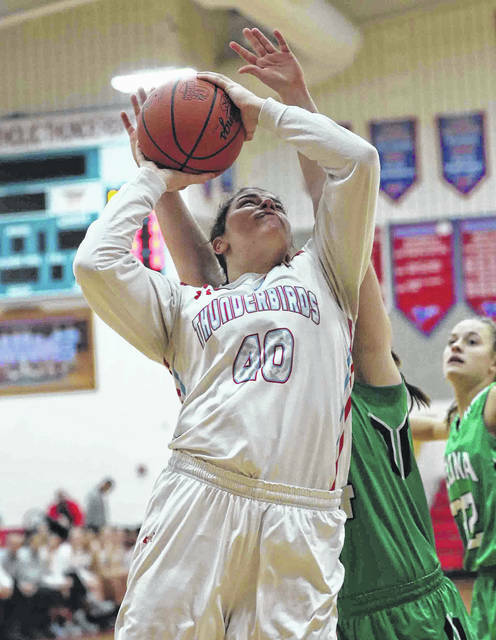 Celina 6-footer Maddy Luebke was one of several Bulldogs in foul trouble and had six points and three rebounds. LCC led 17-15 at the half. Both teams struggled for any offensive rhythm in the first two quarters. The T-Birds came out in the second half and found Williams on the blocks. When Celina dropped help on Williams, she kicked it to the 3-point line to the shooters like Mary Kelly Mulcahy. Mulcahy hit a 3-pointer in the first, second and third quarter. LCC outscored Celina 13-4 in the third quarter to pull out to a 30-19 lead after three. Williams had 10 points in the third quarter, including four layups on the blocks. Mary Kelly Mulcahy chipped in with a 3-pointer to push the LCC lead to 27-19 with 33 seconds left in the third. “We run some plays to her (Mary Kelly) when they do collapse and she made them tonight,” coach Williams said. 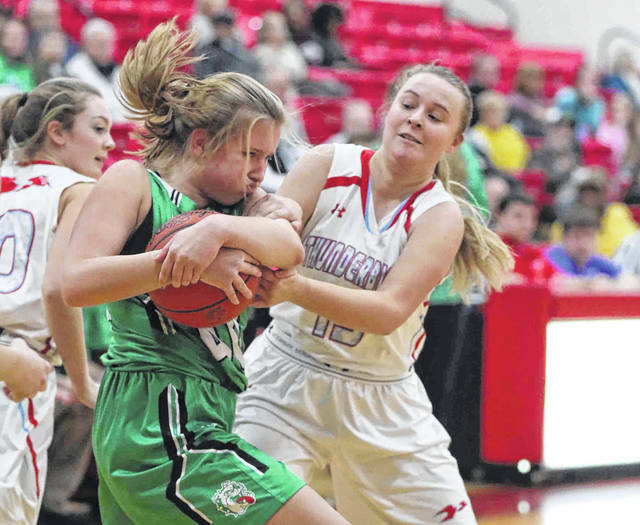 Celina wasn’t able to make a run in the fourth quarter. Coach Williams liked his team’s man defense in the second half. “I challenged the girls (in the second half) to really play good man-to-man,” Williams said. LCC won the boards, 40-37. LCC shot 28 percent from the field and was 4 of 13 on 3-pointers. The T-Birds hit 10 of 16 at the foul line in the fourth quarter. Celina shot 20 percent from the field and was 2 of 12 on 3-pointers. Celina led 11-9 after the first quarter, but LCC took a 17-15 lead into halftime. Mulcahy’s 3-pointer with nine seconds left in the first half gave the T-Birds the lead to stay, 17-15. She had eight points at the half. Rushton was less than pleased with her team’s second half. https://www.limaohio.com/wp-content/uploads/sites/54/2019/01/web1_LCC-vs-Celina-DS2.jpgLima Central Catholic’s Rosie Williams shoots over Celina’s Maddy Luebke in the first half at the Msgr. Edward C. Herr Gymnasium at LCC Schools Monday. Williams finished with 15 points and 17 rebounds. https://www.limaohio.com/wp-content/uploads/sites/54/2019/01/web1_LCC-vs-Celina-DS3.jpgLima Central Catholic’s Hannah Garver tries to take the ball away from Celina’s Emma Homan in the first half at the Msgr. Edward C. Herr Gymnasium at LCC Schools Monday. https://www.limaohio.com/wp-content/uploads/sites/54/2019/01/web1_LCC-vs-Celina-DS4.jpgCelina’s Brooke Robbins tries to get a shot off over Lima Central Catholic’s Ana Rios in the first half at the Msgr. Edward C. Herr Gymnasium at LCC Schools Monday.